Don’t Be Fooled By “Settlement Mill” Law Firms | Hupy and Abraham, S.C.
Year after year Hupy and Abraham is voted Best Personal Injury Law Firm in public opinion polls and rated best by judges and lawyers for ethical standards and legal ability. The individual attention we give to each client and the money we collect for them is the reason we have built the largest personal injury practice in the state of Wisconsin with five offices. We also have large practices in Illinois and Iowa where we have a total of six offices. We advertise on television, frankly, so our clients don’t get caught in the big marketing circus that lawyer advertising has become. 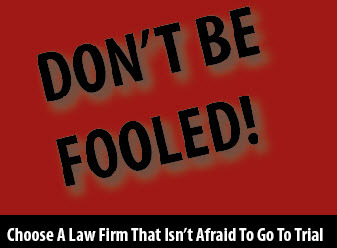 Beware of personal injury law firms that blast the airwaves with clichéd slogans promising quick cash for car accidents. Such firms are focused more on profit than fighting for their clients. Settlement mills are known for taking a large volume of clients, but dedicating the least amount of time possible to each one. Simply put, they’re all about quantity, not quality. This is bad news for clients because settlement mills often leave money on the table by not fighting aggressively for all the money they deserve. Instead of going to trial, or even filing suit, they accept low offers because their main focus is settling cases as quickly as possible. On one hand, it’s great to have your case resolved quickly. But at the same time, wouldn’t you be upset if you found out your lawyer could’ve gotten more money, but didn’t? In their advertisements, some law firms give examples of past clients receiving hundreds of thousands of dollars. But they don’t tell you the whole story. Often times, the settlement number is misleading. One law firm in Milwaukee that does a lot of advertising dropped a client’s case because it didn’t think it could win. The client hired Attorney Michael Hupy and after his original attorney got no offer, Attorney Hupy attained a jury verdict of over one million dollars. Another good example is a case handled by Attorney Jason Abraham. Initially, the insurance company offered $300,000. For a settlement mill, that’s a lot of money. They may have ended the case right then and there. Through further negotiations, Attorney Abraham has attained more than $1,000,000 and is still fighting for another $200,000. If the injured person had made the wrong call and chosen the wrong law firm, they could have lost a lot of money. Ironically, a settlement mill could’ve accepted the $300,000 offer and boasted about this settlement in their advertisements. But is settling a case for one-fourth of its value something to be proud of? Insurance companies know settlement mills are afraid to go to trial and calculate their offers accordingly. Why would they make fair offers when they know there’s little to no chance of a lawsuit? Since Hupy and Abraham isn’t afraid to go to trial, insurance companies know they must pay our client the full value of their claim. Recently, Hupy and Abraham was voted the Best Personal Injury Law Firm in the Shepherd Express “Best of Milwaukee” poll for the fourth straight year. This law firm has built its reputation by giving each case the attention it deserves, not by settling for low offers.